In Hinduism, Bhuvaneshvari (also spelt Bhuvaneswari) is the fourth of the ten Mahavidya goddesses and an aspect of Devi, as elements of the physical cosmos, in giving shape to the creation of the World". Also Bhuvaneswari is considered as the supreme goddesses who creates everything and destroys all the unnecessary evils of world. She is also considered as the Mother goddess of Kali, Lakshmi, and Saraswati also Gayatri. In Hindu Mythology she is considered as the most powerful goddess in the universe. Parvati is Sagun Roop of Goddess Bhuvaneswari. Bhuvaneshwari: The Queen of the Universe. Bhuvaneshwari means the Queen or ruler of the Universe. She is the Divine Mother as the Queen of all the worlds. All the Universe is her body and all beings are ornaments on her infinite being. She carries all the worlds as a flowering of her own Self-nature. She is thus related to Sundari and to Rajarajeshwari, the supreme Lady of the Universe. She is also known as Adi Shakti i.e. one of the earliest forms of shakti. She is capable of turning situations according to her wish. It is considered that even the navagrahas and trimurtis cannot stop her from doing anything. She can order the Trimurtis to do anything she wants. 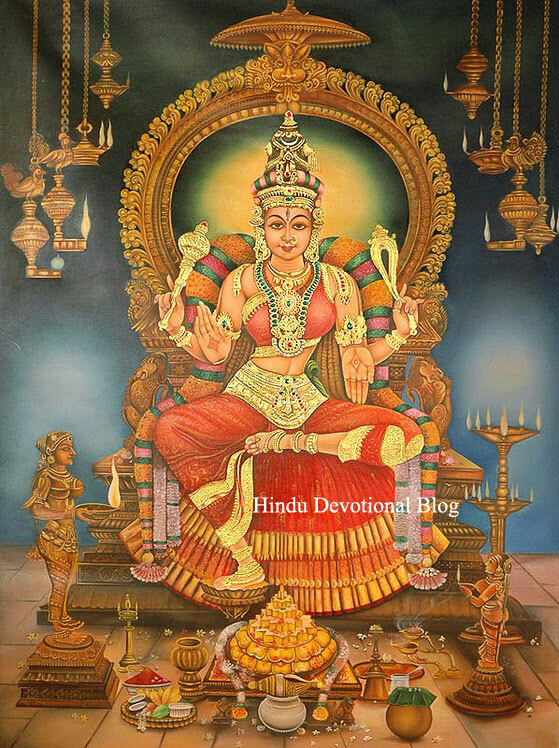 There are several temples dedicated to Bhuvaneshwari across India, however, the most important (Shakti Peetha) is located in Nainativu (Manipallavam) – off the shore of the Jaffna Peninsula in Northern Sri Lanka. Her consort is Lord Lingaraj, an incarnation of Shiva. She is worshipped as the patron goddess of Bhubaneswar and by Utkala Brahmins of Orissa. A small shrine is also dedicated to her inside Jagannath Temple, Puri and Devi Subhadra is worshipped as Bhuvaneshwari.The Samaleswari shrine and Cuttack Chandi Temple in Orissa too are dedicated to her. The Kamakhya Temple too houses Bhuvaneshwari Temple.In South India most of the Srividhya tradition upasaka worship her.In Kerala she is also popular among Shaktas.